I read your lively article about the PowerBook 1400, and it really got me interested in getting a used unit. Between the two, which do you think will be the better buy? I wasn't sure, as you were extolling the merits of the PB 1400. I think they're both good deals. However, if they are in similar condition and your wallet can stand the extra $85, I would recommend the Kanga, which is a lot more machine for the money, notwithstanding my admiration for the 1400. The 3500 has a 20x CD drive - up from the 1400's 8x or 12x unit, PCI architecture (will support OS X with Ryan Rempel's installer hack), built-in 10Base-T ethernet and 33.6 kbps modem, support for the 3400's hot-swappable expansion bay modules (including a standard floppy drive; expansion bay modules from the 5300/190 series will also fit), and a four speaker sound system with its misnamed "subwoofers" that resulted in these models' bulging screen lid. One upgrade from 3400 specs. was a higher-capacity 47-watt/hour Lithium ion battery, and 2 MB of VRAM supporting 24-bit video out and millions of colors on an external monitor. 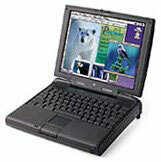 Eighteen-bit color was supported on the 3500's 800 x 600 12.1" active-matrix TFT display (same as the 3400, the LE WallStreet, and the iBook), but an upgrade from 3400 specs was an enhanced Chips and Technology 65554 PCI video controller that supported hardware acceleration for faster graphics, allowing the 3500 to upgrade its screen image 74% faster than the 3400. Also included were 16-bit stereo in/out, Zoomed Video support and software-based MPEG-1 decompression. The 3500's 76-key keyboard with 12 function keys represented one of the machine's weaker points, being identical to the unit the 3400 inherited from the PowerBook 5300, which in turn was pretty much the same as the keyboard introduced on the 500 series PowerBooks. It was serviceable but much inferior to the nice keyboard on the PowerBook 1400 series, and the silky-smooth scissors-action keyboards of the PowerBook 2400c and the G3 Series (WallStreet) 'Books. Zoomed Video is a connection between PC Cards and host system allowing cards to write video data to the VGA controller directly. Since the data is transferred over the Zoomed Video bus instead of the system bus it requires no buffering or interrupts. This is beneficial to both legacy (16 bit) and CardBus (32 bit) equipped systems in terms of performance. Most notebooks with two PC Card slots only feature ZV in one of those slots, usually the lower slot of the two. Typically, CardBus equipped machines will also have a Zoomed Video slot since most CardBus bridge chips feature ZV support. 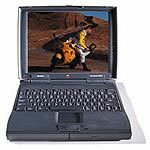 For example Apple's PowerBook G3 systems with ZV support only support Zoomed Video in the lower slot. After having my 1400 for a while now, a couple of thoughts. First off, you got a great deal. Congratulations. Also, I'm probably not telling you anything you didn't know, but. Second, if these things have a caps lock LED, it's news to me. I've never seen a sign of one on mine, nor in the documentation. I get an up arrow in the menu bar when the caps lock is on, right by the date/time. Personally, the passive screen is my biggest complaint. I find it dark and blotchy. On the other hand, it's my first LCD, so maybe I don't know what bad really is. Yes, they are heavy. When shopping for a case, factor in that weight, too. It doesn't take much before you're lugging around a ton. Or tonne, as you're in Canada. I've heard of a neat trick of putting a Compact Flash adapter in the PCMCIA slot (available dirt cheap on eBay) and then running the system off a Compact Flash card instead of the hard drive. Small sizes (16 or 32 megs should be plenty) are cheap now. Sorta like a RAM disk, though not as fast, but it doesn't eat into your limited RAM. Also, I'm thinking you could run ethernet from the PCMCIA slot and video out from the expansion slot, if you were so inclined. My previous owner had apparently found a wireless card that would work in the expansion slot, but it did not come to me. Nor did a CD drive. I did get 48 megs RAM, though. Thanks for the info. I had heard about the Flash Card kludge. Might be worth a try. I didn't know about the Caps Lock icon. I bought a PB 1400c when they first came out, used it for a year, then gave it to my younger son. With 40 MB RAM and 1 GB HD, he used it in Germany while on a year in college and now uses it in Costa Rica. Solid 'puter. I bought a second 1400c, a 117 MHz, and put in the G3 Sonnet CPU. Still very fast. I run System 8.1 also. I'd run System 7.1 if I could, but the PB 1400c requires System 7.5.3 or 7.5.5. Restraints include that I have to upload to Web any files I want to print out on newer printers and that PCMCIA cards are required for modem, ethernet, and any other stuff. I remember when I bought the first 1400c that the selling point was that CPU was replaceable. Too bad RAM expansion and USB weren't dreamed up at the time. Other PBs here include PB 180 and PB 165. Desktops include SE (on System 6), LC 520 (System 7.6.1), iMac 500 (OS 9.1), and Apple IIGS (ProDOS 8). All work. A PB 1400 is a good choice for a college student. A $60 boom-box will do for music. DVD players cost $200. Each device has its use, nicht wahr? I read your column, especially remembering your defense of PB 5300. In regard to your posting about the heat generated from a P'Book 3500, Mobility Electronics has a product specifically made to cool these magnesium and titanium alloy based notebooks called the CoolStand. It retails for about $12 and significantly cools the notebook without a fan. Wondering if you knew of a company that sells a Mac OS X or 9 compatible PC card CD-RW drive. To clarify: a drive that connects to the computer via the PC Card slot on my WallStreet. Not that I'm aware of, but that doesn't mean there isn't one. Perhaps our readers can help.